Howard Leight By Honeywell, AS-30R AirSoft, Multiple-Use EarplugHoward Leight By Honeywell, AirSoft, Multiple-Use Earplug, Item # AS-30R, AIRSOFT Improved, Air-cushioned multiple-use earplug Red Polycord, Reusable Case, 1 Box of 50 pairs. The Howard Leight Airsoft Corded Reusable Earplugs AS-30R are rated NRR 27 and provide comfortable, extended wear protection. 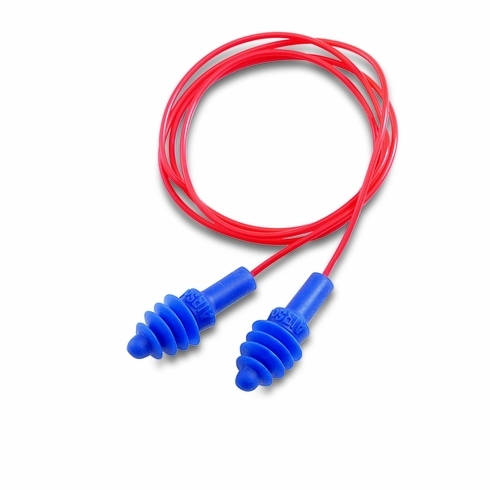 Washable with soap and water, and corded so they don't get lost, the Airsoft Corded Reusable Earplugs from Howard Leight are a great choice for folks who work in a noisy environment on a regular basis. The red polycord connecting the earplugs is 30 in. long. These Airsoft earplugs come packaged by the pair in a box of 50 pairs. Attenuation tested in accordance with ANSI S3.19-1974. AIRSOFT Improved, Air-cushioned multiple-use earplug Red Polycord, Reusable Case, 1 Box of 50 pairs.